We are pleased to announce we have a Stunning litter of gorgeous F1 cavapoos. We have . 3 black girls 3 black boys 2 red. ruby boys Update . 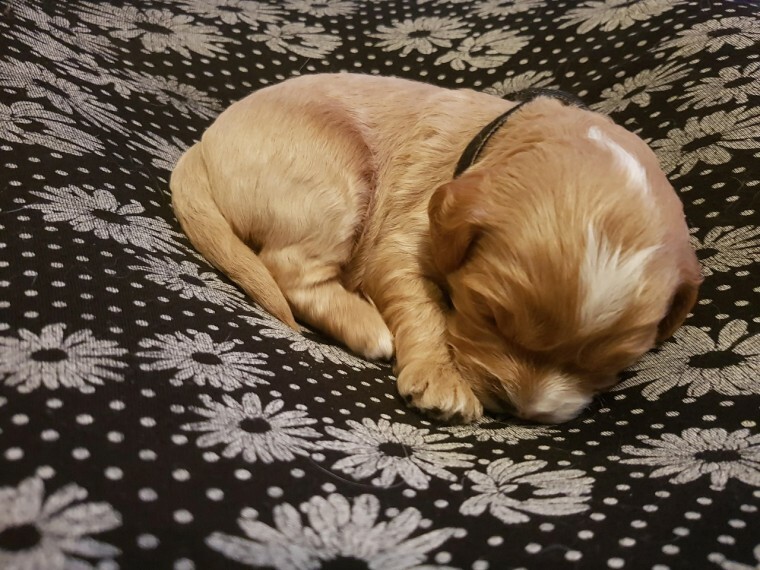 small ruby boy sold Cavapoo pups are truly amazing pets. they are the most loving affectionate loyal pets you could ever ask for. Cavapoos make great companions and are fabulous with children. Non shreading lap dogs make Cavapoos the perfect pets. Mum is our miniature KC registered tri colour cavalier king Charles pet who is the most loving And kindest dog I..ve ever met. And dad is handsome little red pedigree kc registered toy poodle from poodilicious poodles called Clifford who is DNA tested clear for pra. All certificates are here for viewing. Pups will come with. Vet check Microchip 1st vaccine Puppy pack including food. comfort blanket. vet health card. favourite toy and after care advice. Pups are wormed from two weeks onwards. Pups will be ready from 8 weeks and only then if we feel they are ready to leave. Pups will be fully weaned on a high quality puppy food Harringtons. Viewings are welcomed now. We are looking for forever homes only no full time workers please. Boys are 100 Girls are 1200 A 250 Non refundable deposit is required to secure the pup of your choice. You will be given regular updates with up to date pictures as the pups grow. If you have any questions please feel free to contact me.